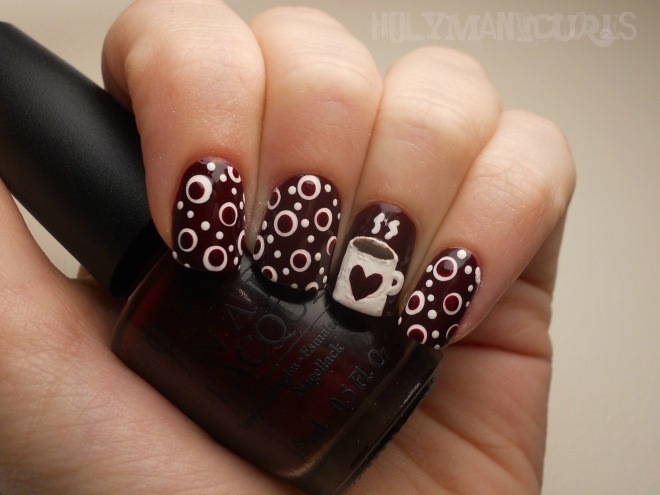 Holy Manicures: Hot Chocolate Nails. Hot chocolate is one of the best things about winter, and so when I saw this youtube video, I knew I had to use it as inspiration for a little nail art! The base color is OPI We'll Always Have Paris, the white is acrylic paint, and for the hot chocolate I used OPI You Don't Know Jacques. This is so cute! And I totally agree hot chocolate is one of the best things about winter(probably one of the only things I actually like about it). 21 year old fashion student with a slight nail obsession. Born Pretty Glitter Liner Polish Review. Born Pretty Velvet Manicure Review. Born Pretty Square Studs Review.